Not too long ago, we've written a guide on how to transfer files from a Mac to an external drive, but that's mostly useful for creating backups and safekeeping. When you're interested in sharing the files saved on your machine with coworkers, family or friends, there are much more convenient ways to do that than personally handing them the drive or even worse, mailing it to them. Here, you will find out how to share files from your Mac, both on a local network as well as over the Internet. If you're transferring files to people that are connected to the same network as you are, say in an office or at a library, then the best way to share your data (especially if we're talking about very large files) is to use the Appletalk Filing Protocol (AFP). Open the Apple menu, go to System Preferences, then click on Sharing and check the corresponding box to enable File Sharing. This action must be done on the Mac that sends as well as on the Mac that receives the files. Find and connect to the desired machine by launching the Finder, pressing the Command + Shift + K key combination and clicking on the Browse button. Select the files that you want to share, then drag and drop them to the Mac that you've found on Step 2 just as you would to any folder from your own device. If the people you want to transfer files to are not on the same network as you, then you will need to do it over the Internet. There are several ways of doing this, but iMessage is one of the simplest and most convenient solutions. The application comes by default on your Mac, so you don't need to worry about installing anything and you aren't restricted to just Macs as you can also share files to iOS devices. Launch iMessage and start a new conversation with the recipient of the file. Drag-and-drop the files to be transferred into the respective iMessage window. Open the Finder, then press Command + Shift + R to launch the AirDrop application. This action must be done on both Macs. Once the other machine shows up in the AirDrop window, drag and drop the files that you want to transfer. The recipient must accept the incoming transfer for the file sharing to begin. 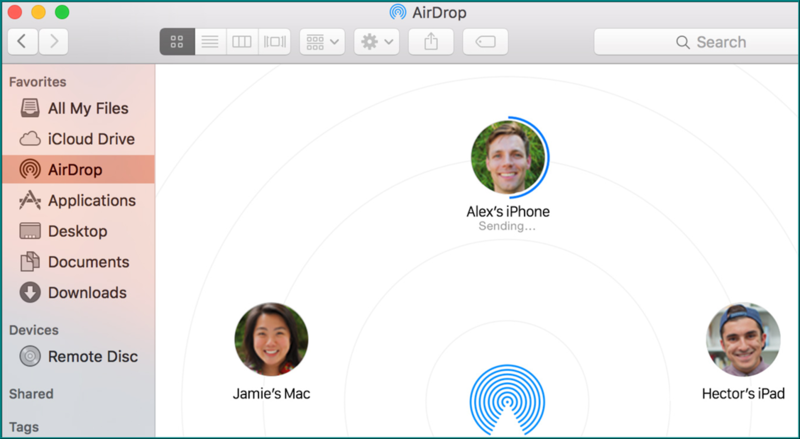 Optionally, in case one of the Macs is using an older an OS, you can use AirDropEnabler to start AirDrop. As you can see, there are several ways to share files between Macs and these are just the easiest ones. Depending on your needs, you can choose options such as third-party instant messengers with file-sharing options, uploading files to the cloud services and sharing them that way or the good old email attachment. The question is, what is your favorite solution for sharing files? Let us know in the comments below.